Almost everyone who starts blogging asks themselves or search engines the very popular question: What Should I Blog About To Make Money? The answer is simple – yet many bloggers explain the process in the most complex way possible. 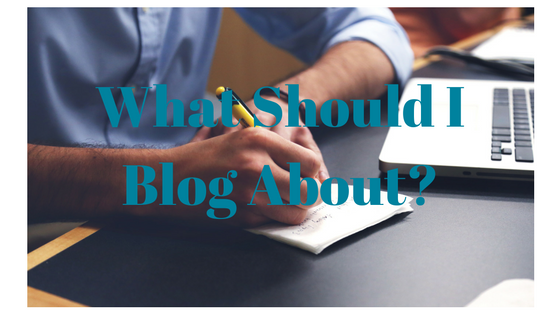 You should simply blog about what you want to blog about. Whatever niche that you are helping out, you should really talk to them in a conversational tone and add value to their lives. This will be the 3rd blog which I am writing today and I am not concerned about getting this post on the top of the search engines. Although, many will argue that bloggers should research keywords as a ritual and make sure to put keywords in the right places here and there. To be honest, keyword research takes a lot of time and energy out of the average blogger, not to mention the content research. I do not really enjoy doing the whole keyword research thing and have to be worrying about which keyword research tool on the market is the best to use. Even when you as a researcher go out and do the full research on a niche and research your keywords, it will be you at the end of the day to be relevant to your niche audience. People who are looking for information from you, really do want to get that “human element” when it comes to getting their information. If you have read my first two posts ever on Smart Human Blogger, you will see me mention this. So, when blogging in your niche, you need to focus on the reader. Get in their head and write things that you think they would like to get more information on. It doesn’t matter if your niche is a competitive one, you just have to keep writing out words upon words to convey the right messages to your audience. It is also a great idea to read what others are blogging about and then write your own blog in your own unique way. Blogging should be easy and fun for the aspiring smart blogger and not a daunting process as some people want you to believe. Let’s face it: we are imperfect. Mistakes help us to become better in life at our tasks. I don’t know about you, but when I make mistakes, I usually have something valuable to take away from the experience. The very famous story about Thomas Edison should inspire you to keep making mistakes. Edison failed thousands of times before he perfected the incandescent light bulb. It is because of his many failures that today we now have the convenience of using the light bulb at our leisure. Never take your time for granted – time is a very precious thing and you should use it wisely. Instead of watching a video about something that will not help you to reach your goals in life, why not watch something that will help you out? The same applies to anything else that you choose to do with your time. Audios, texts, and videos information should not waste your time but rather improve you. Find the right information out there which will help you to succeed in your business. Be an expert in whatever niche you are involved in. Mediocrity is a crime of the worst nature. Why bother to set out to do something if you are not going to be the best at it? Who told you that you cannot do great things? It is always up to you to make the right choices in life and you are always in total control of what you do. Remove the fear from your mind and be sure to get your hands on the prize that you set out for in the first place. You are unique and there is no other person in the world who is exactly identical to you – get to know your inner you and persist past all failures. Set high goals in life or shoot for the moon as some say. When you are setting your goals, think big. Do not limit yourself to 1 billion dollars but rather shoot for the moon by thinking that you can earn 10 billion dollars. Who cares what the naysayers say. All they do is focus on what doesn’t work. You are different (I hope) in this race of life, so set a plan and work towards it. There are people out there who are handicapped in the sense of physicality, however, they have managed to do quite well in business because they made the decision to never let their disability get in the way of their success. Most of you reading this right now has all your limbs intact and ready to go. However, most of you neglect to use your limbs to its maximum potential. Why do we do this? Is it because humans take things for granted when we have it in abundance? All I know is that the ones who make big differences in life are the ones who utilize all the tools available to their advantage. As I mentioned earlier in this same article, this is my third post for today and so far this one is at 877 words. I emphasize this not to be cocky or anything like that, but just to show you that you too can write about what you want to write about without having any fear whatsoever. What if someone does not like what you write? Is it the end of the world? Certainly not – it should be considered as something good. I mean, someone took the time out of his or her day to leave a comment on your website. To me; that is something really cool – whether it be positive or negative. Still, do not focus on writing stupidity, but rather something worthwhile. So set your goals today and move ahead in life. Isn’t it great to be different from the rest? Doesn’t it allow you to stand out online or anywhere else? So why do so many people copy each other? It is because most people do not see themselves great at something. They think that only what is already written out there is worth seeing and reproducing. Not so! You can become a real unique blogger when you start seeing yourself as a smart, unique blogger. Google loves content just as how a drug addict loves drugs or even more than a fat kid loves cake – Focus on giving Google what their bots want. You will see your rankings start pumping up and you can be greatly rewarded if you are smart enough. I am going to stop here for today. Stay tuned as I will be discussing something important and valuable in the next post. I am glad you stick around to the end of this post and hopefully, now you know what you are going to be blogging about the next time you blog. If you liked this post, you may also like my previous posts so check them out! Previous Post: Previous post: Think Money, Not Pretty! Next Post: Next post: What Is A Blog? Copyright © Smart Human Blogger 2019 / Theme: Actions, designed by WP DevHQ.